Breeding Range: Atlantic Coast west to the Great Plains (Whitehead and Taylor 2002). Breeding Habitat: Northern Hardwood, Oak, Central Hardwood, Bottomland Hardwood. Nest: Weakly constructed hammock-like cup; 3-9 m above ground in deciduous trees and shrubs. Nesting Dates: Eggs: late May to late July (Robbins 1991). Foraging: Hawking from close to ground to lower canopy. Habitat use during Migration: Somewhat more variable than nesting habitat, including young secondary vegetation. Arrival Dates: Early to late May (Robbins 1991). Departure Dates: Early August to early September (Robbins 1991). Winter Range: Central America and northern South America. Winter Habitat: Lowland forests of variable age and rainfall, but avoids open habitats. 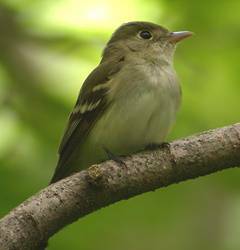 The Acadian Flycatcher in southern Wisconsin has a narrow preference for areas of moist, climax forest with large trees (Bond 1957). It prefers mature forests of sugar maples, basswoods, hemlocks, and oak (Ambuel and Temple 1983, Robbins 1991, Bielefeldt and Rosenfield 2006) and occasionally occurs in pine plantations (Bielefeldt and Rosenfield 1992). It is found in some of the darkest portions of Wisconsin forests, especially in deep, shady ravines along streams (Schorger 1927, Mossman and Lange 1982, Whitehead and Taylor 2002). The Acadian Flycatcher is a forest-interior species and is adversely affected by various disturbances in the forest canopy, including power-line corridors (Kroodsma 1984). Forest area was the most important determinant of nest-site selection in the Mid-Atlantic states (Robbins et al. 1989). In Wisconsin, Temple (1988) estimated a minimum area requirement of approximately 100 hectares. Nest sites often have a high percentage of canopy cover and low percentage of ground cover (Bisson et al. 2000). In Waukesha County, Wisconsin, over 50% of Acadian Flycatcher nests in conifer plantations were supported by buckthorn and elm saplings (Bielefeldt and Rosenfield 1992, cited in Matteson 1994) and box elder saplings. In deciduous forests, elm saplings were most common supports for nests (Bielefeldt and Rosenfield 1992). Wisconsin is on the extreme northwestern edge of the Acadian Flycatcher’s range (Whitehead and Taylor 2002). Despite an abundance of suitable habitat in the northern regions of the state (i.e., hemlock, sugar maple, and yellow birch forests), Acadian Flycatchers are largely restricted to the south. Mossman and Lange (1982) suggested that competition with other forest species, particularly the Least Flycatcher, may be responsible for its northerly limits. Wisconsin Breeding Bird Atlas observers recently documented breeding activity in 12 counties not previously reported as part of its nesting range (Bielefeldt and Rosenfield 2006). The Acadian Flycatcher is an uncommon summer resident in the southern half of Wisconsin (Robbins 1991). Breeding Bird Survey (BBS) data suggest an annual but not statistically significant decline range-wide (Sauer et al. 2005) but there is insufficient data to determine trends in Wisconsin. 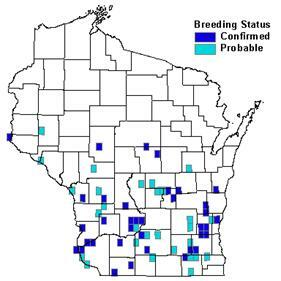 During the Wisconsin Breeding Bird Atlas, observers recorded breeding activity in approximately 7% of the surveyed quads (Bielefeldt and Rosenfield 2006). The Acadian Flycatcher is an area-sensitive species (Whitehead and Taylor 2002) that is adversely affected by forest fragmentation (Robbins 1979, Kroodsma 1984). Continued forest fragmentation resulting from urban and agricultural expansion in southern Wisconsin is a concern for this state threatened species. The conservation of large tracts of mature forests is critical to maintaining stable populations of Acadian Flycatchers in Wisconsin. Areas with a high potential for restoration, such as young stands or small tracts of deciduous forest in southern Wisconsin, should be identified and managed to meet this species’ habitat requirements. Since many large forested areas in southern Wisconsin are not publicly owned, the application of sustainable forest management practices is necessary to encourage the retention and production of large mature forests with tall closed canopies and high tree density (WDNR 2005). These actions will benefit other woodland bird species such as Cerulean, Worm-eating, and Hooded Warblers. Conservation and management strategies for this species should be focused in the following ecological landscapes: Central Lake Michigan Coastal, Central Sand Hills, Central Sand Plains, Southeast Glacial Plains, and Western Coulee and Ridges (WDNR 2005). Within these landscapes, key conservation sites include Wyalusing State Park in Grant County (Mossman and Hoffman 1989), Kettle Moraine State Forest (Volkert 1992), Golden Lake Woods in Jefferson and Waukesha counties (Robbins 1991), and the Cook Arboretum in Rock County. Mossman and Lange (1982) considered the Acadian Flycatcher as one of the “characteristic” birds of the Baraboo Hills, which has several areas of suitable habitat. Work with banded populations in small and large forest fragments would help clarify patterns of sources and sinks in the landscape and provide better guidelines for management of this species (Whitehead and Taylor 2002). In Wisconsin, more research is needed regarding minimum patch size and the effects of forest fragmentation. Intense, targeted survey efforts are needed to obtain better population trend data in the state. Ambuel, B., and S.A. Temple. 1983. Area dependent changes in the bird communities and vegetation of southern Wisconsin forests. Ecology 64: 1057-1068. Bielefeldt, J. and R.N. Rosenfield. 1992. Acadian Flycatcher nesting in conifer plantations in southeastern Wisconsin. Passenger Pigeon 54: 43-49. Bielefeldt, J. and R.N. Rosenfield. 2006. Acadian Flycatcher. In Atlas of the Breeding Birds of Wisconsin. (N.J. Cutright, B.R. Harriman, and R.W. Howe, eds.) The Wisconsin Society for Ornithology, Inc. 602pp. Bisson, I.A., D. Martin, and B.J.M. Stutchbury. 2000. Acadian Flycatcher, Empidonax virescens, nest site characteristics at the northern edge of its range. Can. Field Nat. 114(4): 689-691. Bond, R.R. 1957. Ecological distribution of breeding birds in the upland forest of southern Wisconsin. Ecol. Monogr. 27(4): 351-384. Kroodsma, R.L. 1984. Effect of edge on breeding forest bird species. Wilson Bull. 96: 426-436. Matteson, S.W. 1994. Conservation of endangered, threatened and nongame birds in Wisconsin 1 July 1993 to 30 June 1994. Passenger Pigeon 56: 247-261. Mossman, M.J. and K.I. Lange. 1982. Breeding birds of the Baraboo Hills, Wisconsin: Their history, distribution and ecology. Wis. Dep. Nat. Resour. and Wis. Soc. Ornithol., Madison. Mossman, M. J. and R. M. Hoffman. 1989. Birds of southern Wisconsin upland forests. Passenger Pigeon 51: 343-358. Rappole, J.H., E.S. Morton, T.E. Lovejoy, III, and J.L. Ruos. 1993. Nearctic avian migrants in the Neotropics. U.S. Dept. Int., Fish Wildl. Serv., Washinton, D.C.
Robbins, C.S. 1979. Effect of forest fragmentation on bird populations. Pp. 198-212 In: DeGraaf, R. and K. Evans. Management of north central and northeastern forests for nongame birds. U.S. For. Serv. Gen. Tech. Rep. NC-51, St. Paul. Robbins, C.S. 1980. Effect of forest fragmentation on breeding bird populations in the piedmont of the mid-Atlantic region. Atl. Nat. 33: 31-36. Robbins, C.S., D.K. Dawson, and B.A. Dowell. 1989. Habitat area requirements of breeding forest birds of the Middle Atlantic states. Wildl. Monogr. 103:1-34. Robbins, C.S., J.S. Sauer, R. Greenberg, and S. Droege. 1989. Population declines in North American birds that migrate to the Neotropics. Proc. Natl. Acad. Sci. 86:7658-7662. Sauer, J.R., J.E. Hines, and J. Fallon. 2005. The North American Breeding Bird Survey, Results and Analysis 1966 - 2005. Version 6.2.2006. USGS Patuxent Wildlife Research Center, Laurel, MD. Schorger, A. W. 1927. Notes on the distribution of some Wisconsin birds. I. Auk 44:94-112. Volkert, W.K. 1992. Survey of the birds of the northern Kettle Moraine region. Passenger Pigeon 54: 137-145. Whitehead, D. R. and T. Taylor. 2002. Acadian Flycatcher. The Birds of North America, No. 511 (A. Poole and F. Gill, eds.). The Birds of North America, Inc., Philadelphia, PA.